The baby boomers have gone gray. The youngest of them are in their mid-50s, sprinting toward their senior citizen discounts and fumbling for their reading glasses. But the generation that ushered in aerobics classes, jogging, and in-home treadmills to popular culture aren’t slowing down. Gyms, rec centers, and fitness classes are filled with people in their 60s and 70s. 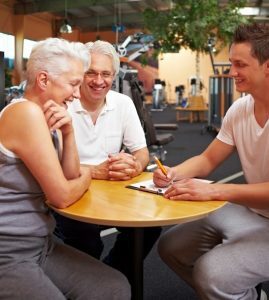 If you’re a personal trainer, health/rec center owner/operator, or sporting event planner, you need to be cognizant of the particular health and safety concerns when working with seniors. You can expect that most seniors have significant health-related histories that range from failing vision to cardiac disease and anything inbetween. It’s important that you obtain a current and detailed medical history from all seniors, which should include current medications, allergies, implanted devices and past surgeries. One of the first things to degrade as we age is our sense of balance, which means an increased risk of falls. Minimize these risks by making monitoring trip hazards such as curled mat edges, rugs that slip, wet area and split-level step ups. Time and use have left their mark on the joints, bones and muscles of seniors. Arthritis and osteoporosis are common ailments among seniors. The results can be loss of cartilage, lack of joint-lubricating fluids, and diminished strength of tendons and ligaments. Such issues leave seniors more susceptible to falls, stress fractures. Age also has a way of affecting our reflexes, so seniors typically react more slowly. It’s important to recognize that senior athletes may be in good physical shape to participate in their activity of choice, but their reaction time may be less toned, which can result in accidents. Heart and lung-related medical issues are often not immediately apparent, which makes them that much more dangerous. This is a perfect example of why having a medical history on file is important. 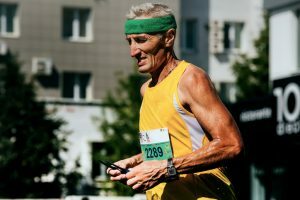 Seniors with such histories should be required to provide clearance from their medical provider before participating in vigorous or moderate to high aerobic activities. Heart disease can result in a decreased supply of oxygen to the muscles, which can cause shortness of breath, chest pain and even a heart attack. A defibrillator should be available at your facility or sporting event and staff trained in its use. Seniors with a history of smoking, asthma and chronic lung disease should be monitored for signs of stressful breathing. Extremely hot and humid conditions can also impact breathing, as can pollen when participating in outdoor activities. Eyesight is among the first senses to be affected with age. Suggest to those who wear glasses that they bring an extra pair just in case they break theirs. Better yet, suggest they invest in sports lenses or a sturdy headband to prevent glasses from falling off. Consider taking the proactive step of keeping a glasses repair kit on hand. Adequate lighting, especially in corridors and restrooms, is essential. While many seniors live with varying degrees of hearing loss, most do nothing about it. Consequently, they miss much verbal information, which can cause confusion and accidents. It helps to have as much information as possible available in print documents. Clear signage is also important in facilities and venues. As stated earlier, heat and humidity are significant concerns for senior citizens. They’re also more susceptible to dehydration. Make sure seniors athletes always have access to seating, shade, and plenty of water when it’s hot to avoid any level of heat illness. Encourage them to wear hats and sunglasses when possible and to apply sunscreen. Rain means puddles and slippery surfaces, and we already know seniors are prone to falling. Monitor the paths and playing areas for accumulated water and slippery areas, as well as holes and debris such as trash and limbs and leaves. No need to fear working with senior athletes. Most have been active for many years and are aware of their limitations. But being prepared for the unexpected is your best bet in dodging liability in the event of an injury. Source: Marc I. Leavey. “Planning a Sports Event?” Sports Destination Management. March/April 2017.